More stimulus for the U.S. economy could be on the Federal Reserve's agenda when its policy committee meets this week. The Fed will present new economic forecasts at the conclusion of its two-day meeting on Wednesday. 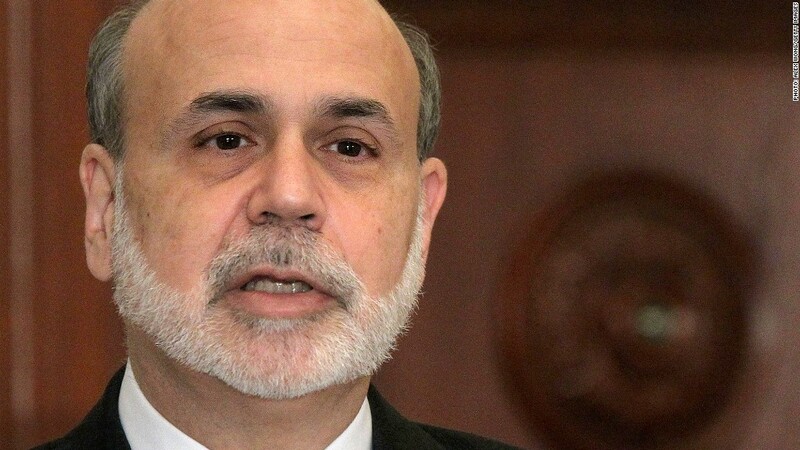 Fed chairman Ben Bernanke will also discuss the state of the economy at a press conference. Bernanke should be able to point to the fact that a much-needed recovery in the housing sector has taken hold. And that's partly due to the Fed's effort to reduce mortgage rates and keep them low. Hiring has continued at a modest pace since the Fed's last meeting as well. The unemployment rate fell to 7.7% in November, its lowest level since 2008. Yet many wild cards remain, making it difficult to get an accurate reading on the economy and where it's heading. The drop in the unemployment rate was largely because workers dropped out of the labor force. Superstorm Sandy has also distorted many economic indicators recently. And uncertainty about the fiscal cliff has economists predicting anything from a full-blown recession to a slight pick-up in growth in 2013. The Fed must weigh all this at its meeting. Meanwhile, it also has to decide the fate of one of its stimulus programs: Operation Twist. The policy, set to end this month, let the Fed sell short-term Treasuries it already owns in order to buy longer-term bonds. The basic goal of Twist has been to lower long-term interest rates without having to increase the dollar amount of the assets on its books. Here's the problem though. The central bank is quickly running out of short-term bonds available for it to swap in a one-for-one exchange. That's why economists are expecting Fed officials will soon agree to simply buy more bonds. "It's most likely they're going to convert Operation Twist into some kind of outright purchase program," said Tim Duy, an economist at the University of Oregon who runs a blog popular among Fed watchers. The options? Paul Ashworth of Capital Economics, said the Fed could double down on its purchase of mortgage-backed securities, which currently totals $40 billion a month. That program puts downward pressure on mortgage rates. The Fed announced this third round of quantitative easing, or QE3, in September. The more likely move, however, is for the Fed to say it will buy more Treasury bonds as a way to keep longer-term interest rates low. Goldman Sachs economists predict the Fed will buy $45 billion in Treasuries per month, the same amount it was adding during Twist. Other economists predict new Treasury purchases will be less than $45 billion a month. That's because the new purchases would expand the Fed's balance sheet. Another option for the Fed includes changing its communication policy. Some Fed officials, including Chicago Fed President Charles Evans, have been pushing for the Fed to set explicit numerical targets for the unemployment rate and inflation to make it more clear when the Fed might decide to act. The hope is that such targets would lift some of the mystery surrounding the Fed's decisions. But there's been disagreement on what those targets should be. Evans thinks the Fed should aim to get the unemployment rate down to 6.5%, while not allowing inflation to exceed 3% a year. Boston Fed President Eric Rosengren, wants a 7.25% target for the unemployment rate. Both officials will have votes on the Fed 's policymaking committee in January, along with Esther George of Kansas City and James Bullard of St. Louis. The Fed has kept interest rates near zero since late 2008 in an effort to stimulate the economy. At some point, the central bank will need to start raising rates as the economy improves. But the Fed said at its last meeting in October that rates would likely remain "exceptionally low" through mid-2015. Follow CNNMoney's @AnnalynKurtz on Twitter for live tweets of the Fed's press conference on Wednesday.